A bit of a cheat as this original watercolour of the Bluecoat has been sold so it may not be in Liverpool now. There’s several other similar works by the talented local painter though available from liverpoolgallery.com and they have an open evening at their venue in the Albert Dock colonnades this evening, they’ll be open until 21.00. This picture made me realise just how much I miss this view of the front of Bluecoat Arts Centre, can’t wait for it to re-open early next year. 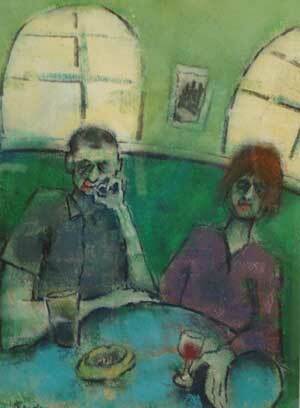 The exhibition is now in full swing and it’ll be a good chance to get together, (any excuse for a glass of wine). There are several new pieces exhibited in the gallery and also displaying some poetry. Also at the Albert Dock this evening there will be an Exhibition of work by Liverpool John Moore’s University students in ‘Site’ and several other Units, and a preview evening at No.8 The Colonnades for an exhibition called ‘Lines of Investigation’. Everyone’s welcome and it should be a lovely evening around the Dock.